G & S Gas is proud to service Milledgeville, GA, and the surrounding areas. G & S Gas Service Inc. has been providing energy efficiency and comfort to businesses and residential homes in Milledgeville GA for over 50 years. Our Milledgeville, GA propane services include installing above ground and underground tanks, gas lines, gas logs, heaters and fireplace kits. We can also monitor your tank’s gauge and based on your average usage, your tank will be automatically filled when it starts to run low, ensuring you always have gas when you need it. In 2014, the Milledgeville, GA area was hit with storms that caused widespread power outages. G & S Gas Service INC is your local Generac home generator Certified Sales and Service Dealer. We can prepare the installation site outside your home, place the generator, run the natural gas or LP fuel line, install the transfer switch, and make all of the necessary electrical connections. Once installed, we will make sure that your backup generator runs properly, and is ready to protect your home in the event of a power outage. We can service all types of gas appliances, including home heating, space heating, cooking, grilling and home generators. We can install above ground and underground tanks, gas lines, gas logs, heaters, fireplace kits, gas grills and propane cooktops. Interested in a Home Generator? In 2014, the Milledgeville, GA area was hit with severe storms that caused widespread power outages. G & S Gas Service INC is your local Generac home generator Certified Sales and Service Dealer. We can prepare the installation site outside your home, place the generator, run the natural gas or LP fuel line, and arrange all of the electrical connections. Once installed, we will make sure that your backup generator runs properly, and is ready to protect your home in the event of a power outage. We can even set your generator up on an annual maintenance program in order to ensure your generator is in top condition. Have an outdoor living space? Let G & S Gas help make your outdoor space even more enjoyable with a gas fire pit or outdoor kitchen. We sell a wide variety of built in and portable grills, fire pits, deep fryers, and grill accessories. Contact our office to schedule a free estimate! 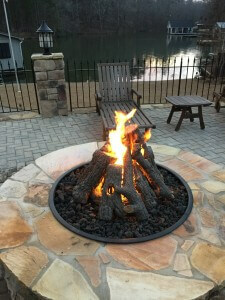 Check out our installations gallery for pictures of some of our recent installations for our Lake Oconee customers.